What is Japanese style toilet? I had the same question before my trip to Japan. During preparation for this trip I found there two styles of toilets in Japan: “Japanese” and “Western”. I was very curious to see how that Japanese style looks like. It won’t be big surprise for you if you have been traveling in countries like Russia as you could see similar toilets there too. Don’t worry if you afraid you don’t know how to use it. In most public toilets you’ll find both (Japanese and Western) style toilets. In hotels there are Western style toilets so won’t be any problems to use it there. 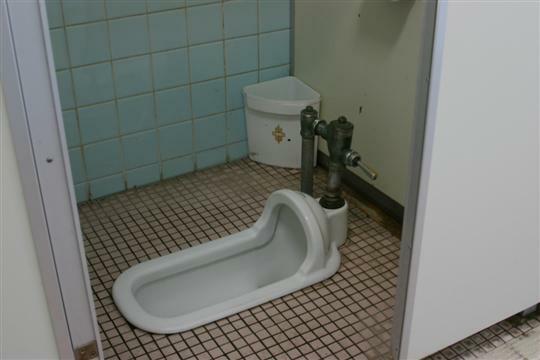 It was another main issue with public toilets in Japan. Toilet paper usually is not provided in public washrooms. Paper towels or dryers are not always available too. So always carry paper tissues with you in case you’ll need to use public toilet. Check here for instructions how to use Japanese style toilet. I don’t think I could use this safely. I would definitely need to avoid the sake if this was the only option! That’s pretty state of the art compared to the toilets I’ve seen in China. 😀 I haven’t been in China yet, but I didn’t have problems using these in Japan.